As we enter the last month of the year and I prepare for a Texas winter (such that it is), I welcome you to December Wildlife Wednesday, the final installment for 2017 of watching wonderful–sometime wacky–wildlife! Wild critters in my garden are busy with their lives and are also providing entertainment and learning experiences for me. I trust your garden has been graced with some wild happenings as well. Winter Texans of the avian sort are settled in, having migrated from their breeding grounds in northern North America. These various songbirds will spend the next 4-6 months of relatively mild weather eating their fill of available berries, seeds, insects, and suet in preparation for the arduous migration back to the places where they raise families. These–and all birds–will be easier to spot once my deciduous plants shrug-off their foliage garb (leaving said foliage unceremoniously on the ground for me to pick up) and while that process has begun, it’s at least a month away before bare-n-naked trees will allow for better bird viewing. 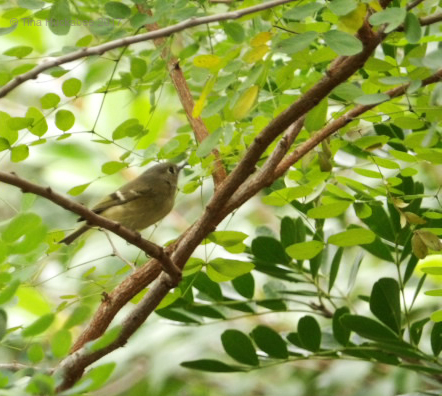 This Ruby-crowned Kinglet, Regulus calendula, is one of a pair visiting my back garden daily. The ruby streak on top of the head isn’t visible; this one could be a female. I’ve only spotted the female at the suet feeder, but I’m sure the male pops on for a nosh, too–but, so far, not when I’m looking. I eagerly await a glimpse of ruby-red in the garden which flashes when defending territory or charming Ruby-crowned Kinglet gals. 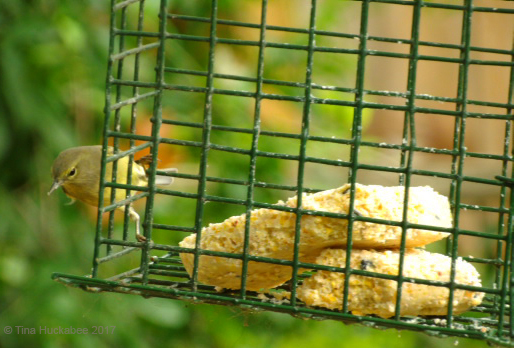 An Orange-crown warbler, Oreothlypis celata, frequently partakes of suet. Easier to spot on the feeder, I prefer to watch them work through the garden, rapidly moving from limb to limb, and shrub to shrub, snipping insects as they go–but it’s challenging keep up with their speed-feeding movements. Less colorful than some of the other songbirds, these little ones are elegant and with charm to spare. I think there are two Orange-crowns in the garden, but haven’t definitively confirmed that. 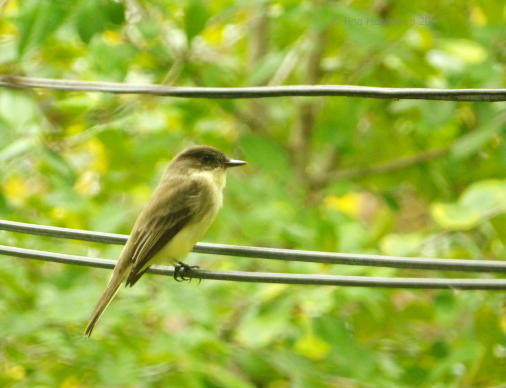 For weeks, I observed one or two Eastern Phoebe flycatchers, Sayornis phoebe, but was either too slow with the camera, or didn’t have it at hand. One morning on my way out, I saw this beauty through my bedroom window. I sprinted to where my camera awaited assignment, grabbed and prepared it for the shots as I hurried back to the window. Success! I didn’t dare step outside, as these birds have my blundering number and always take flight as soon as I make an appearance. Interestingly, I haven’t seen the phoebes since these photos, so I hope my paparazzi-like behavior didn’t scare them off. 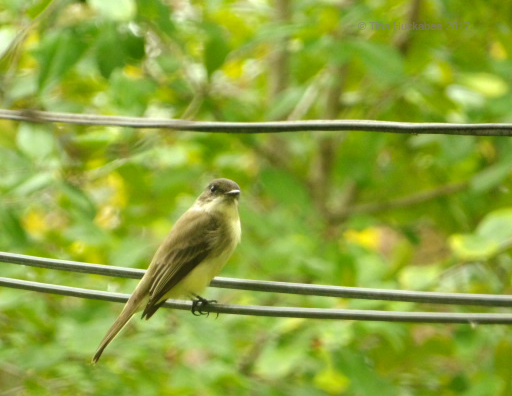 According to All About Birds, these flycatchers are year-round residents in some parts of Central Texas, though they are new to me. Their wintering grounds span West, East and South Texas and southward through Mexico. The local bird characters provide a show as they go about their daily business. 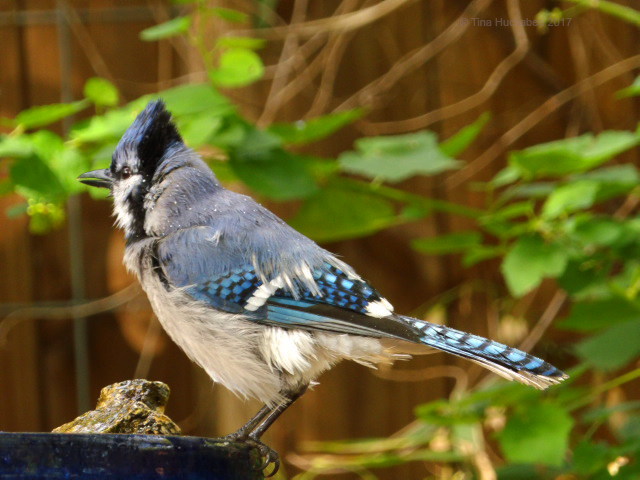 A bathing Blue Jay, Cyanocitta cristata, always elicits a grin. 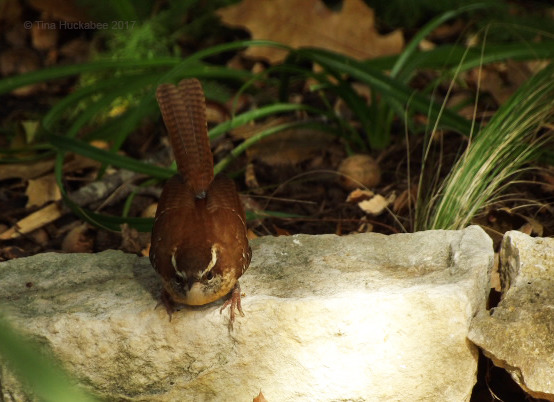 …or this Carolina Wren, Thryothorus ludovicianus, wins the cute bird-of-the-month prize. This wren is certainly laser-focused on something worth investigating. 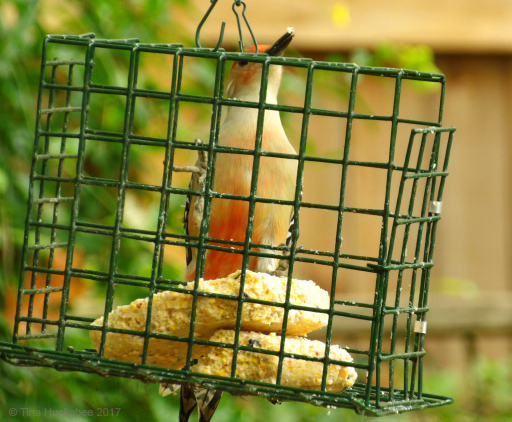 A male Red-bellied Woodpecker, Melanerpes carolinus, loves the suet I provide once the temperatures are reliably cool. A female Red-belly also visits; I assume they’re mates, but don’t know where their nest is located. 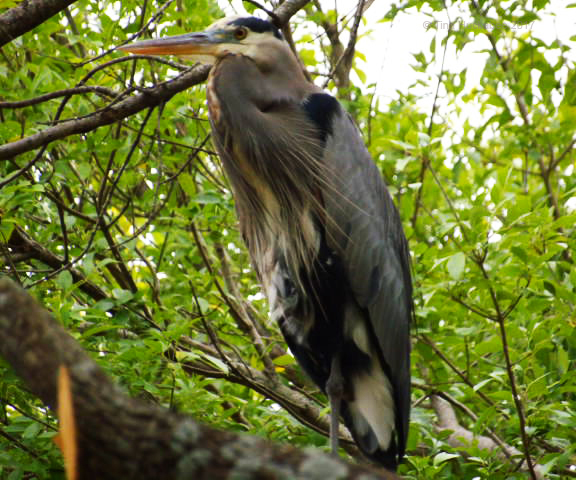 Not in my back garden, but I spotted this gorgeous Great Blue Heron, Ardea herodias, resting in my neighbor’s tree late one afternoon. I see Great Blues fly over my neighborhood throughout the year, as they keep a keen eye on the urban creeks which spiderweb through Austin. In my own garden, they pop in mid-to-late spring after I’ve pruned the pond lilies, which frees-up access to available fish. For a month or so, the poor little fish are vulnerable because they have fewer foliaged places to hide and the herons know that when lily pads are limited, they’re ‘shooting’ fish in a barrel! I was pleased to see this handsome heron, though it loped off as I gawked in admiration. 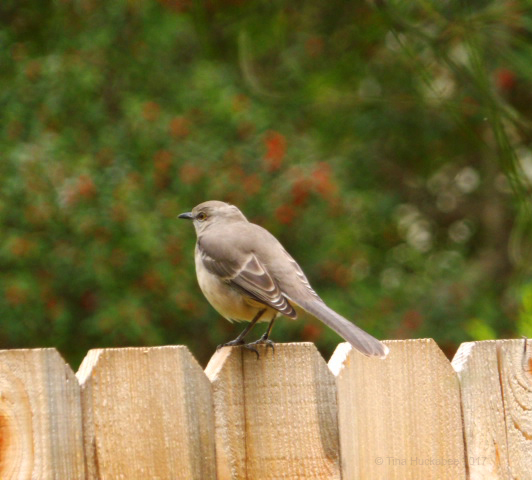 The state bird of Texas is the Northern Mockingbird, Mimus polyglottos. I’ve seen this one, perched silently and un-singing, on the back fence. On Thanksgiving morning I was sipping coffee and perusing the local newspaper at my kitchen table. From where I sat, there is a clear view to the back garden and I looked up just as a large, fast bird streaked across my line of vision. Recognizing a hawk in hot pursuit, I snatched my camera and caught this just-landed Red-tailed Hawk, Buteo jamaincensis, in a neighbor’s tree. Wow! This bird was huge, so I’m guessing she’s a female and probably disgruntled at the lack of her own Thanksgiving feast. Dove with cranberry sauce, anyone?? As I snapped a few shots, a Blue Jay was harassing her, so she took wing, landing on another tree further away. Ms. Red-tailed refused to turn around and acknowledge my presence. She perched there for a long time, probably re-thinking her strategy for snagging a meal. 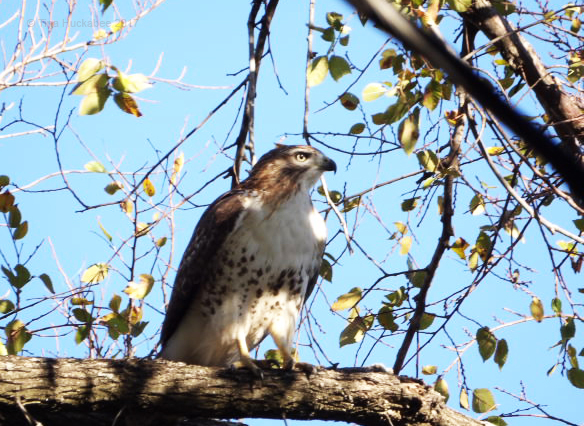 There are a variety of smaller raptors in my neighborhood: this autumn I’ve seen a Cooper’s hawk and a Sharp-shinned hawk–but I think this is the first time that a Red-tailed has wooshed through the back garden. The birds are active, but they’re not the only winged-things around. 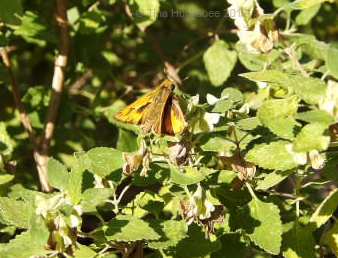 There have been plenty of butterflies, moths, and honeybees, though the native bees have gone to sleep for the season. The cheery, yellow Southern Dogface, Zerene cesonia, is a common autumn butterfly here, but always so flighty that I rarely catch a good photo–until recently! Woot! Nectaring on the autumn crop of Purple Coneflower, Echinacea purpurea, this one shares the bounty with an equally busy Southern Broken-Dash, Wallengrenia otho. The orange-brown on the wings is plenty attractive, but the Southern Broken-Dash also shows a beautiful, iridescent blue-green on the upper side of its thorax. 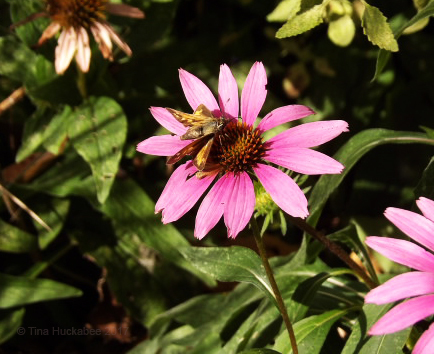 Nectaring at a Purple coneflower. Sunning on the foliage of the Shrubby Blue sage. 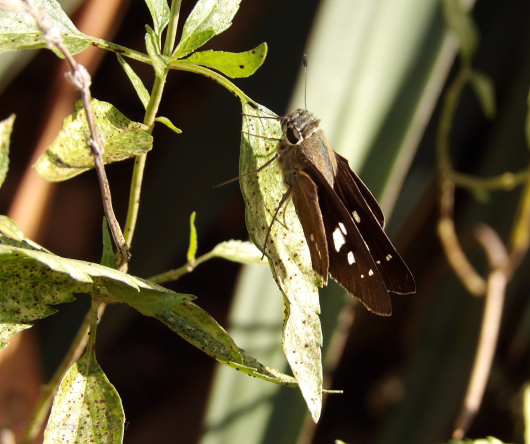 That same afternoon, this Clouded Skipper, Lerema accius, also vied for attention. I’ve been amazed and quite pleased at the numbers of small skippers and even larger butterflies in my garden this past month, though I’ve mostly appreciated their beauty and not rushed to get photos. Keep up the good work, pollinators! It’s not all about desirables in the garden though. I thought I’d attempt attracting Eastern Blue Birds–or something equally fascinating–by leaving dried mealworms (yuk to me, but some birds totally dig them), but all I’ve managed to attract is this critter. 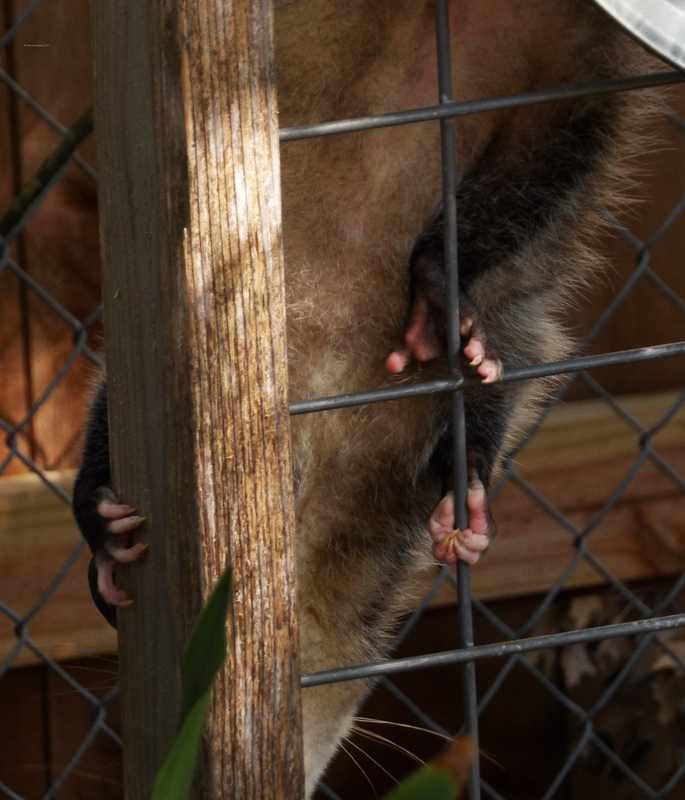 A drooling Virginia Opossum (Didelphis virginiana). Grrrr. As well, I suspect her in the crime of squatting in the Eastern Screech Owl house. Everytime we open up the house to make it available for house-hunting owls, the camera shows a snoozing, or sometimes bathing, opossum. We wait until nightfall, let her vacate her comfy digs (opossums are mostly active after dark) then trundle up the ladder to (again!) close the door on the hole of the house for another week or so in hopes of discouraging her. Once we reopen the door for owls looking for a home, invariably, within a day or so, Ms. Opossum snuggles back in. It’s a drag being outsmarted by an opossum! She enjoyed the mealworms, but I’ve removed them from the bird buffet menu. She’ll just have to get her worms like the other opossums–by digging in my garden! I don’t mind opossums (I keep telling myself), but this one is persistent and just won’t vacate the premises. Check out her climbing claws. She may not be fast, but she’s adept. Soon, the neighborhood owls will be courting-n-sparking and they’ll want that cozy box for their babies–you know, the one that we built for THEM! This entry was posted in Biodiversity, Eastern Screech Owl House, Uncategorized, Wildlife food, Wildlife Gardening, Wildlife Gardening in Ausin, Wildlife Habitat, Wildlife Wednesday by Tina. Bookmark the permalink. Gads! Opossums are so . . . possumy! Ick! They do have an ‘ick’ factor, but one of the things I’ve learned about them is how clean they really are. With the camera in the owl house, I often see him/her bathing–very cat-like. So, as critters go, pretty tidy, I’d say! Also, they eat baby rats; and rats are worse than opossums. Beverly Hills (in the Los Angeles area) has one of the worst rat populations in urban areas in America (because of the overgrown landscapes), and that is why opossums are so common. We do not see the rats very much, but dead opossums are all over the roads. Oh, I agree–rats are the worst! Interesting that Beverly Hills has so many. They need to imports some raptors and maybe between the raptors and opossums, the rat population will decline. 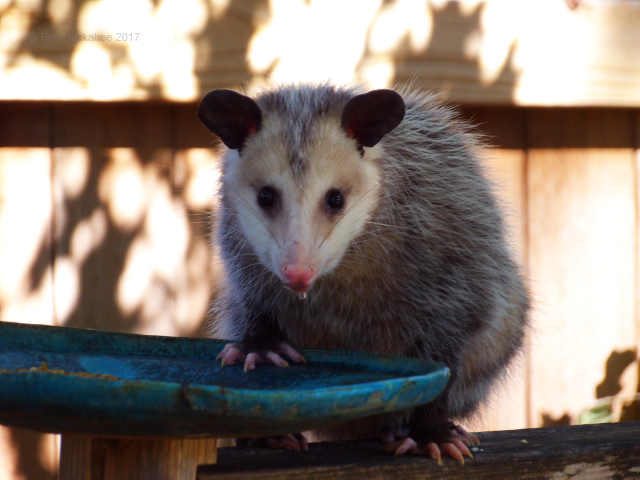 You are so lucky to have possums….they will find and eat any ticks you have in the garden and also they are the only animal that doesn’t get rabies. Lovely photos! Did you know that one common name for the persimmon tree is (also) possumhaw? We’re used to thinking of it as a common name for Ilex decidua, but in some areas it also applies to the trees. Your blog is as useful for identifying things I find in the hill country as any guide! When I was up there last, there were those pretty Southern Dogface butterflies everywhere. It was the pink trim that caught my eye, and sure enough, my photos match yours, and those in the guide. I recognize that Frittilary in your header, too. There were literally dozens of them at the Brazoria refuge week before last. And look at that mating plummage developing on your heron! That boy surely is going to attract a very nice girl, with all those pretty feathers! While the waterbirds are pouring into the refuges, someone has set up shop in the palm tree just outside my window. I’ve never seen it, but it has an extremely loud call: two notes, repeated over and over and over and… It never varies. I finally snapped-to and realized that YouTube surely would have something to help, and of course it does. Even just listening to videos like this can help to weed out what it isn’t. Differential diagnosis of bird song — who knew!? I didn’t know about possumhaw as a synonym for persimmon–interesting! Those Southern Dogface are really beautiful, I was so tickled to get a good shot (finally!) as they don’t sit still for long. I’d love to get one with wings spread because the upper wings have such beautiful markings and like you, I always notice that pink trim! Yes, I think that heron will be quite the catch for some lucky heron-girl! My neighbor had his trees over-pruned (where did this style of stripping a tree of all but its top limbs come from?? ), so he had a nice place to perch. I don’t know if he had his eye on my pond, that’s certainly a possiblity, though I’ve only seen that in spring. The video is great! Thanks for the link. I’m listening/watching as I write. This is really helpful to me, as I’m not very good with the songs. I’m glad you saw so many frittilaries. Most of my passion vine froze last winter in the two hard freezes we experience. I’ve had a bit return from the roots, but not much. I’ve been trying to figure out where I could plant some in my increasingly shady back garden and it’s no-go there, but I have come up with a plan for moving a trellis to part of the front garden where the vine will get lots of sun. Next spring though, I’m afraid. This was wonderful. I loved the wet blue jay photo. Thanks for sharing pictures of your friends. You’re welcome! Those bluejays are real performers! I think my question was answered about suet and meal worms. I was wondering about how you kept the other wildlife out of it. 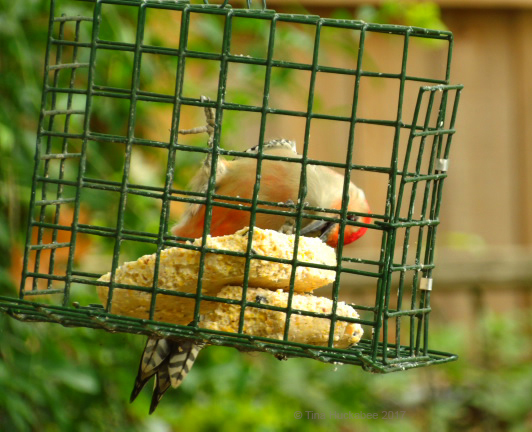 I can’t put out anything like suet and the “others” get into my seed and sugar feeders. I had raccoon footprints all over the porch and it appeared it was looking into the windows. Ha ha, I don’t keep the others out very successfully! It’s tricky-I don’t mind other wildlife, but they can become pesky! I’ve totally removed the mealworms as none of the birds around here liked them. 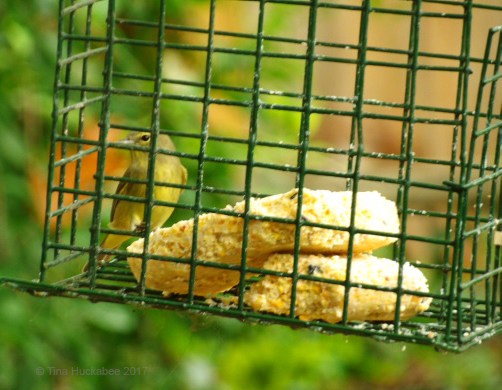 The suet hasn’t been a problem, but I only use it in the winter–it’s just too hot here the rest of the year. Racoons!! We were washing off our solar panels a few weeks ago and my husband noticed racoon footprints and an open spot in the screen to prevent them from going underneath. He repaired it, but thanks for the reminder–we need to check that again. Tina your garden is a house for wildlife. The photos are magnificent. 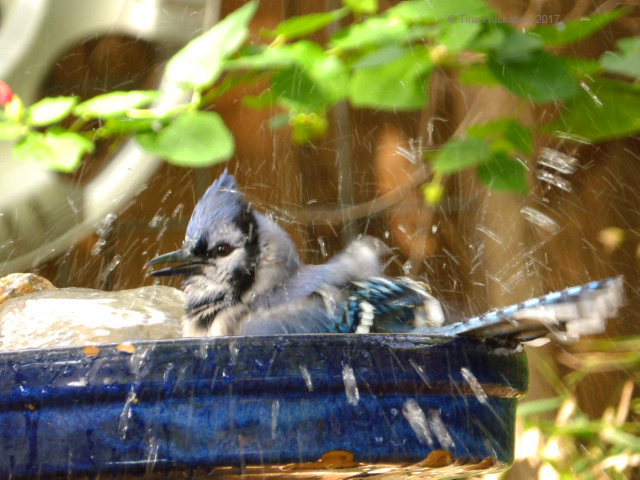 I love the Blue Jay bathing; everything wet is very funny. I vote for Cardina’s Wren, it’s very nice. The Red-bellied Woodpecker is ravenous eating tallow. The Blue Heron is beautiful, I like it a lot like the Red-tailed Hawk. 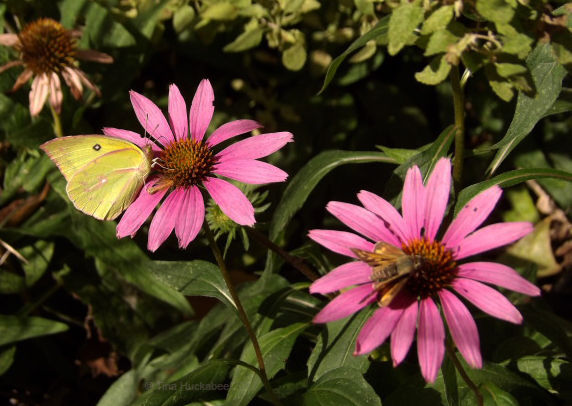 I love all the birds that come out and the butterflies with the Echinacea purpureas. The opossum is doing the same with the Owls’ nest as last year. He has taken care of him: but he has to understand that this is not his house. Tina is a great pos, as always. Let’s all enjoy the wildlife in our gardens! Greetings from Margarita. Thanks, Margarita! I’m glad you liked all the birds and photos. You’re right, the opposum is doing the same as last year! I hope she’ll move on somewhere else. Good luck deterring the opossum from your box. I feel your frustration and sympathise. Reading your post has made me realise that there is a big gap in our feeding regime, because I am totally missing suet … balls/slabs etc. I think I stopped originally because of the squirrels, but I was just reading about making a christmas wreath for the birds containing things like fat encrusted pine cones. Maybe I should start with that! Love your blue jay, he gets my vote. 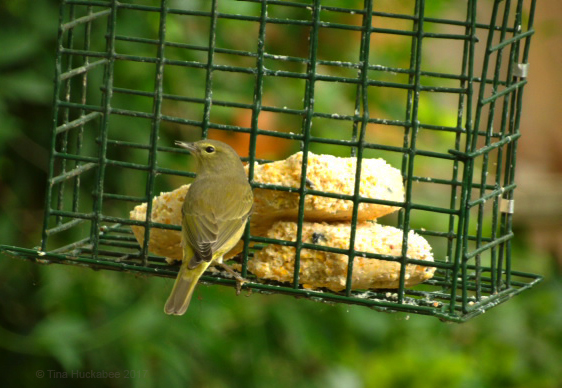 My winter birds really like the suet. I don’t make my own, but purchse a commercial brand, but the box will last the winter. As for the opposum, I think we’re going to need some luck, little scamp! Those are beautiful images of the birds and the other wildlife! It’s fun to watch the birds in all seasons. I just saw a Tufted Titmouse this morning chipping away at the ice on the birdbath. The funny thing is, we have a heated birdbath just a few feet from the frozen one. Maybe he was getting some extra nutrients from the salts and debris in the ice. It’s wonderful and entertaining to have these year-round garden visitors! Thank you, Beth. I can just see that little titmouse wrangling away with the ice! One wonders what they think as they do things that seem illogical, though I imagine they have their reasons. 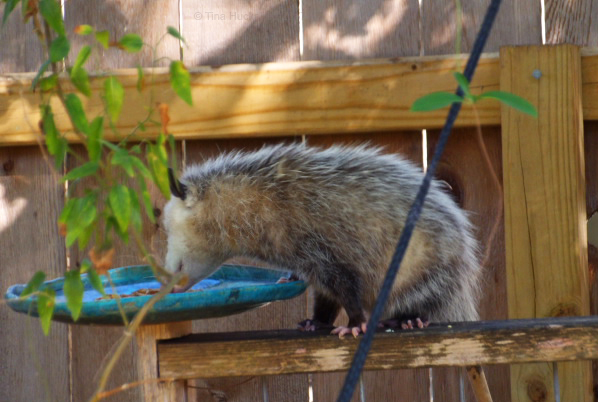 My ‘beloved’ opposum was knocking off the basin of one of my bird baths, eventhough there are FOUR birdbath at ground level. No clue what he/she was thinking! 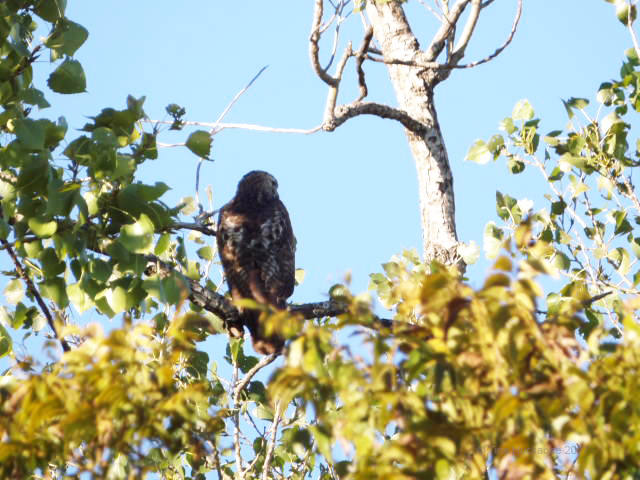 Wonderful sightings, especially the hawk which rarely lands within range. We’ve tried unsuccessfully to discourage possums too. Here’s my observations for the past month or so. Thanks, Shirley. Opposums are quite set in their ways, I’ve concluded! Lovely photos of your wildlife visitors Tina, so much variety! 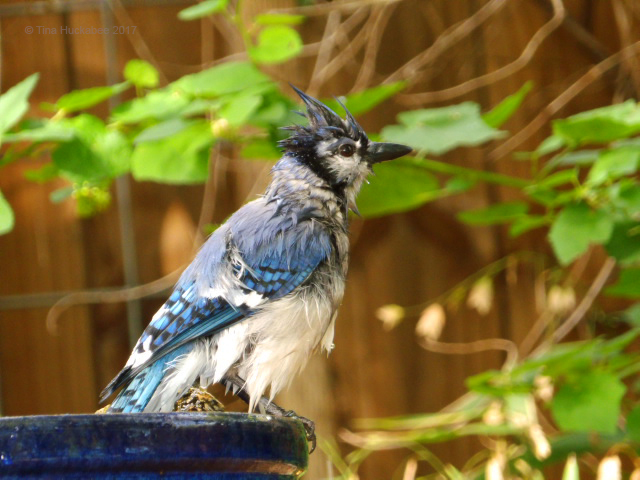 The blue jay after its bath is so cute! The opossum looked quite comfy and cosy in your owl box. Could you make a box just for the opossum so it leaves the owl box alone, or would you rather it didn’t hang around? Thanks, Sue. There really is quite a nice variety of birds (and other critters!) here in urban Austin. I’m very appreciative of that fact. I’m trying to talk the husband into putting together another box–I think that might be a solution. My vote goes to the Chickadee. (No surprise there, they remind me of Sweden, so I definitely have a soft spot for them.) I wish you luck with the ‘possum eviction, but have to say I admire its persistence. Would moving the owl house be an option? 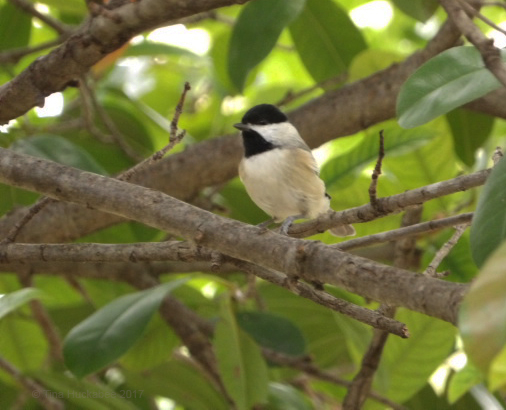 Chickadees are darned cute! I agree that the opposum is resilient and smart, given where she’s choosing to kip. Not sure whether moving the owl house would matter; there are two trees in the back large enough to host the house, I would imagine this intrepid opposum would find the placement. Sigh. Enjoyed reading about your wildlife. Such nice images and commentary. I vote for the Carolina Wren for the cuteness award. Ah, thanks! 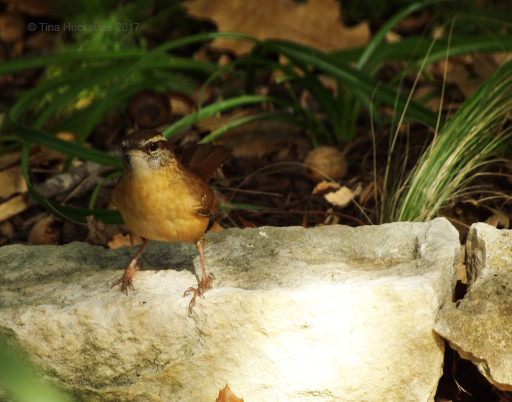 One of my favorite birds–the Carolina Wren–a beautifully singing cutey.